Style and comfort should always be top priorities when purchasing office furniture. One must have piece of furniture is the ergonomic executive office chair.This chair is a comfortable, efficient office chair that will relieve body pains that are related to long work hours. The majority of discomfort workers suffer at the office is poor posture caused by uncomfortable chairs. Stylish Office Interior Design. These chairs are made from high quality stitched leather. This allows them to be durable office chairs with excellent seating. It also makes for attractive furniture. Great neck support. The average office chair doesn’t offer efficient neck support in comparison to the ergonomic executive office chair. This chair provides great neck support because it’s often connected to the chair’s body and the neck support can be adjusted to different specifications of height to make users highly comfortable. Lifetime Health Benefits. The chair is able to improve the health of users because it is contoured to line the spine for healthy posture. For more details, read The Benefits Ergonomic Chairs Can Offer Office Workers. Don’t spend tiresome, painful hours at work. 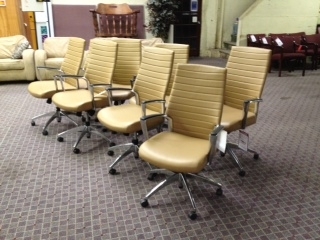 Purchase a Close-Out Deluxe Executive chair from Mark Downs Office Furniture. This entry was posted on Friday, July 27th, 2012 at 1:56 pm. Both comments and pings are currently closed.